In case you're still in need of a gift for your old man, and he happens to be the type to appreciate a blazer with hand-stitched Latin proverbs hidden beneath the lapels, we've got just the place for you. It's a fleeting menswear mecca courtesy of Rowing Blazers, open tomorrow through September 15th in Little Italy. 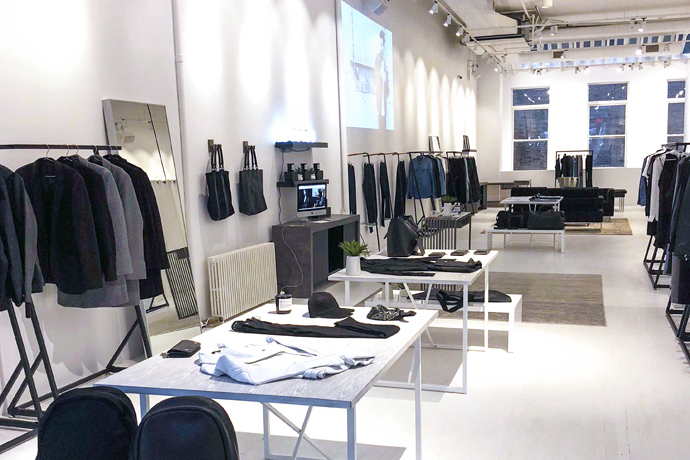 If you're into menswear, you may be familiar with the space—the pop-up will live on the corner of Grand and Centre, formerly the menswear store Odin. It's now got a real clubhouse feel: mahogany foosball tables, leather couches and an ancient Coke machine help lend that sort of vibe. In addition to the NYC-based brand's blazers, rugby shirts and polo jerseys, they'll also have a rotating lineup of brands joining them throughout the summer. First up is Eric Emanuel, a street wear brand whose Bieber and Kevin Hart-beloved retro basketball shorts actually have more in common with Rowing Blazers than you might think. Both brands draw inspiration from vintage sportswear, are detail-obsessed and made in New York... actually, right across the street from each other in (arguably the hippest intersection of) the Garment District. Oh, and they'll also have a selection of coveted watches from Wind Vintage on offer, which may be the perfect solution to any Father's Day-shaped obstacles standing between you and Sunday.